It's amazing what a fresh coat of paint can do! I have had this sewing table for quite some time. It was a lovely hand-me-down from my inlaws. It's been sitting in the basement and I kept telling myself I needed to work on it. I finally got my act together this past weekend and went to the paint store. Once I had the paint, I couldn't wait anymore and started right away. I brought this ball of yarn along to the paint store with me for inspiration! It is Madelinetosh - Tosh Lace in Turquoise. 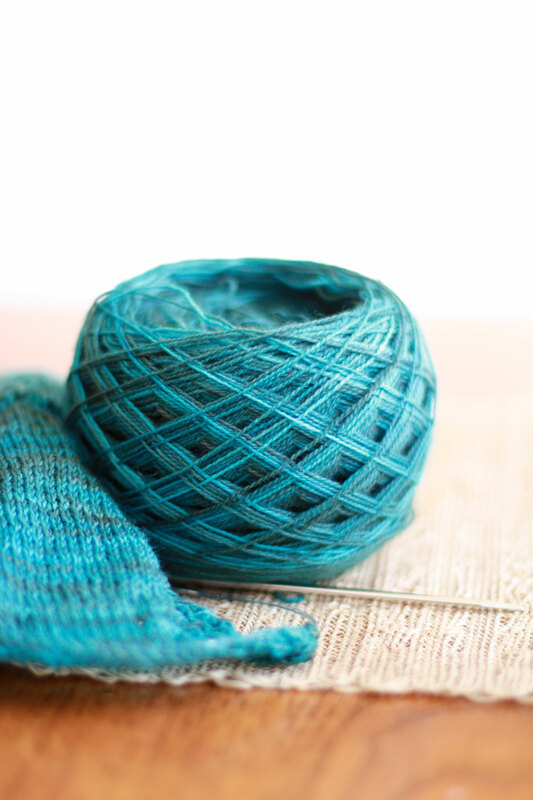 I'm working on something new with this yarn that I'm excited to share, but that's for another day - hopefully soon! 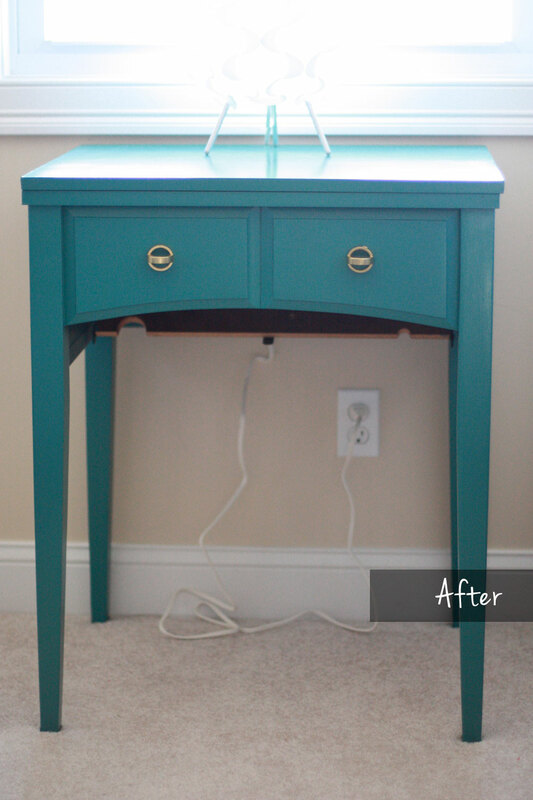 The color I settled on is called Tropical Turquoise by Benjamin Moore. I used their Advance product which is oil-based, but is quick drying and can be washed off hands with soap and water. I highly recommend it! I don't know why I waited so long to do this, because it was an incredibly quick project and I'm thrilled with the results. 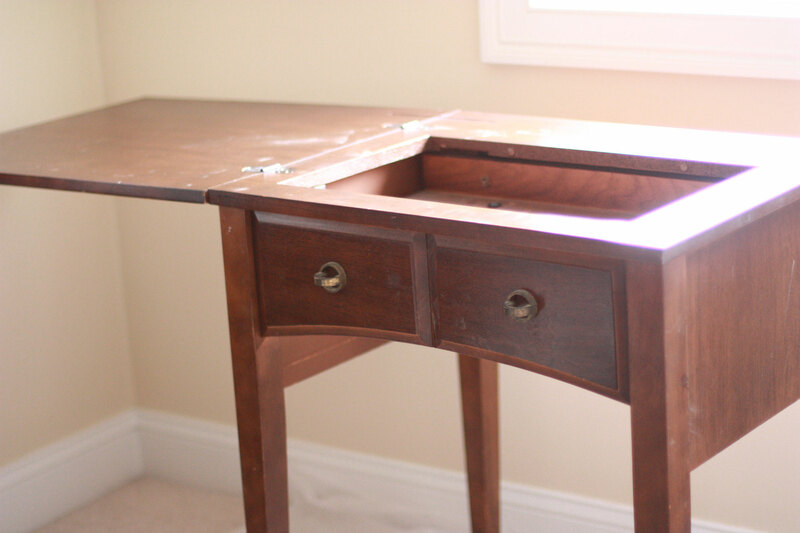 Even though it's technically a sewing table, I plan to use it for all my crafting adventures! 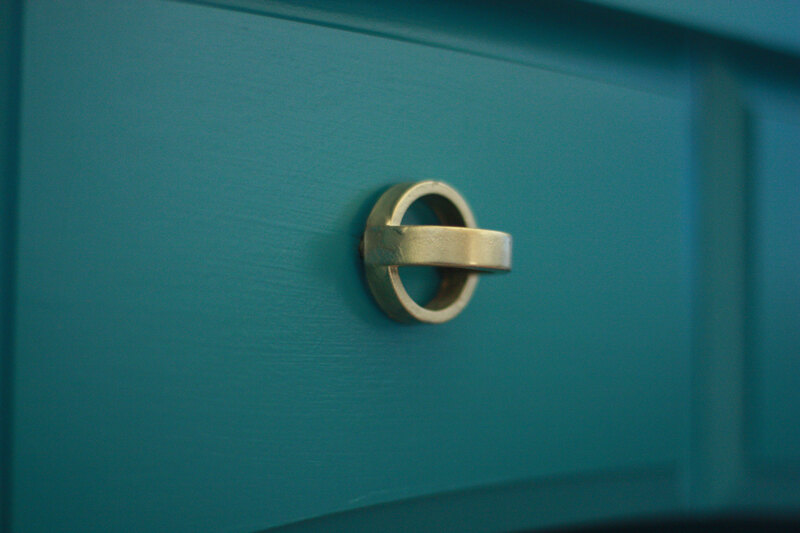 I have some leftover paint and I'm eyeballing items around the house to see what else I can use it on, but I have a feeling this color is good in small doses only! Looks great; did you have to sand it down before painting , or just paint right over the original finish? Wow! 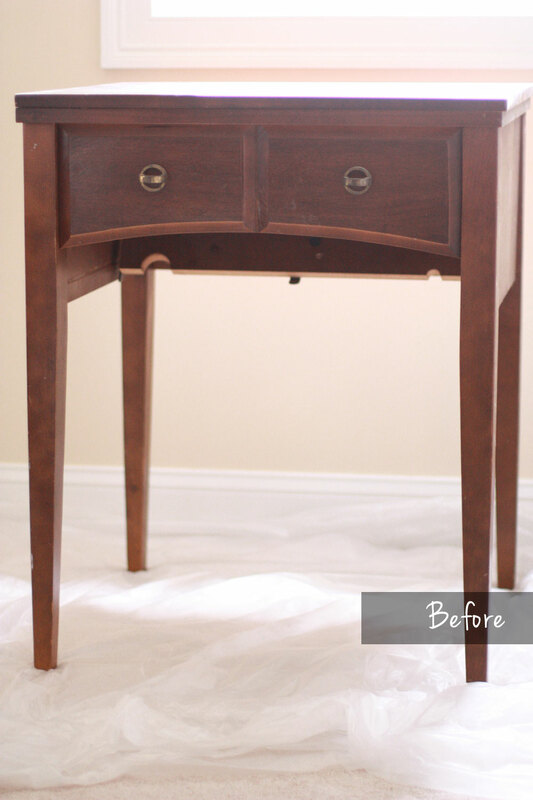 It’s really amazing what a fresh coat of paint can do to a worn out/old piece of furniture! Wow that turned out really nice! Beautiful! 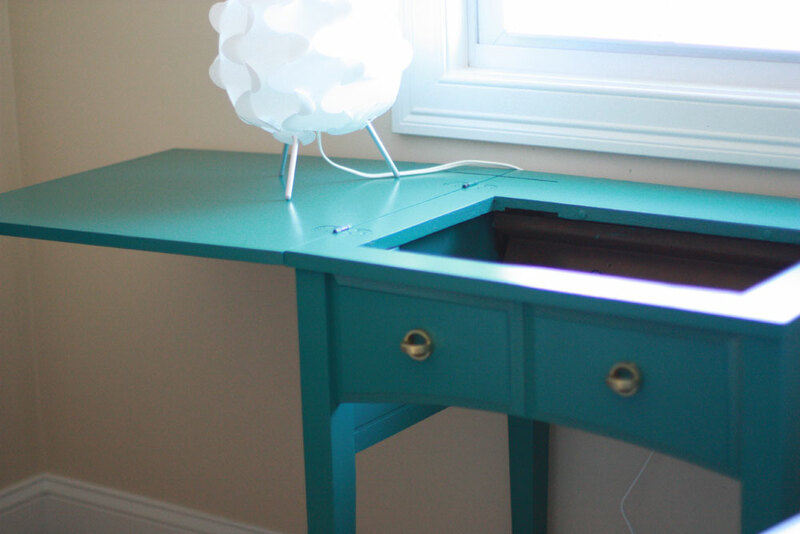 I have the exact same sewing table-I will have to try to paint mine!! Hey Sheila! I didn’t sand it, just right over the original finish. At Booma’s he mentioned if it was going to get a lot of use that there is a coat of a bonding primer type thing, that you can do in between the original and the new color that bonds them together without having to sand it. I didn’t do it because I figured by the time this paint wears off, I’ll be ready for a new color! LOVE it! Great job Kar! I absolutely LOVE the color that you chose! This turned out to be a very cute and classic piece! Love your style! What a nice shower gift! Not the original machine, but my in laws gave me a new one for a shower gift when we were getting married so I have a new one that I love!